Behold the third Vegas installment! Those of you interested in our outlet purchases will have to wait awhile. I'm stretching this out, as I'm a bit short on entertainment this week due to things at work hanging over my head. I also prefer presenting only one restaurant per post, so it's not just my workload that's delaying my shopaholic readers' gratification. But at least those who like to eat (i.e., all of you) will enjoy this entry. 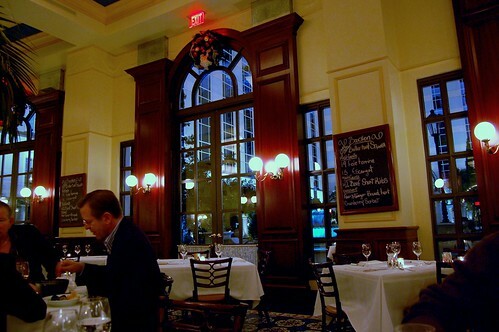 We capped off Saturday by dining at Bouchon after 9 p.m. Why 9 p.m.? That's when the outlets finally closed and kicked us out. Salade Maraîchère au Chèvre Chaud ($11). 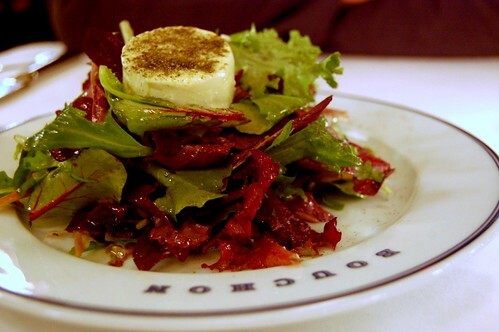 The mixed greens with red wine vinaigrette, warm goat cheese, and herbes de Provence were a great way to start the meal. Simple, fresh, inviting. Soupes à l'Oignon ($9.75). I adore French onion soup. I think I could eat it every day, at least during fall and winter. Bouchon's version did not disappoint. Underneath that big blanket of bubbly fromage was a huge piece of fresh bread, swelled with savory broth and embraced by onions that melt in your mouth. 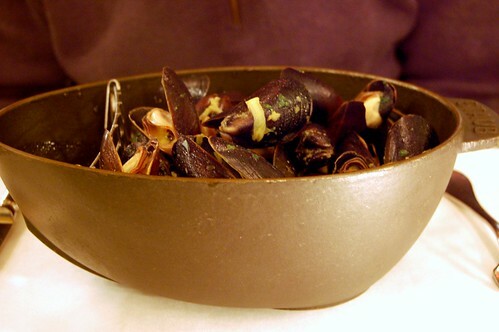 Moules au Safron ($28.50). Mr. Monkey really enjoyed his Maine bouchot mussels steamed with white wine, mustard, and saffron and served with pomme frites. The vessel was totally filled with garlic, which made Mr. Monkey very happy. Epaule de Porc ($34.50). I opted for the braised pork shoulder with glazed root vegetables, celeriac remoulade, and pork jus. Fanfuckingtastic. So good that it requires profanity. So good that I need not say more. When Mr. Monkey polished off his mussels, a busboy asked him, "Amigo, you want some bread?" 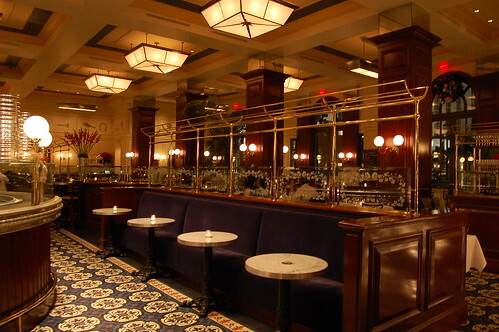 Nevermind that Bouchon is a French bistro. Mr. Monkey replied enthusiastically, "¡Sí!" 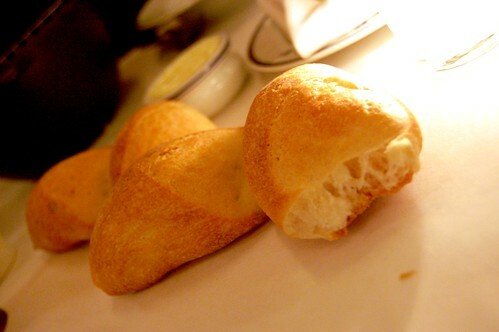 He used these warm crusty rolls to sop up the remaining garlic goodness of his dish. Ok, I admit to swiping one and buttering it to my delight. 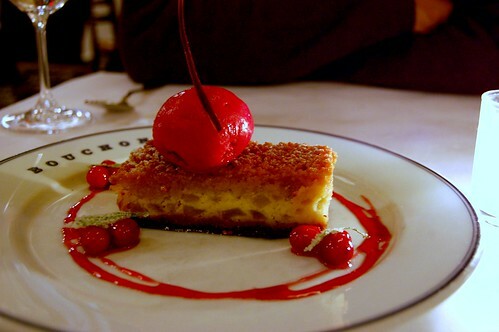 The baked goods at Bouchon are excellent and not to be missed. The dessert special of the night was a pear and ginger bread tart with cranberry sorbet ($9). The word "special" does not do this sweet ending justice. In fact, this deserves a second photo. 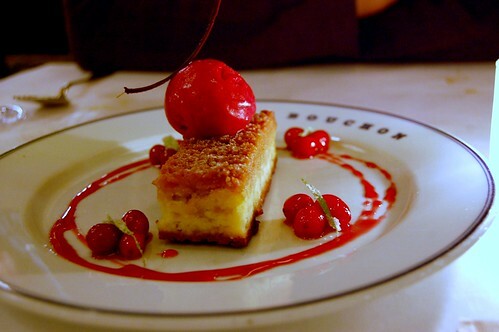 Like all other Bouchon bakery creations, the bread tart was to die for. Soft, crumbly, buttery airiness topped with icy tartness. Nummers to the max. This was our last decadent meal of the trip. Well, maybe. I'll let you be the judge of whether the next meal qualifies as further indulgence. Um, wow. I will definitely be heading there next time we are in Vegas. I love chevre. I love French onion soup. I love mussels. and bread. and especially butter. I love warm goat cheese. 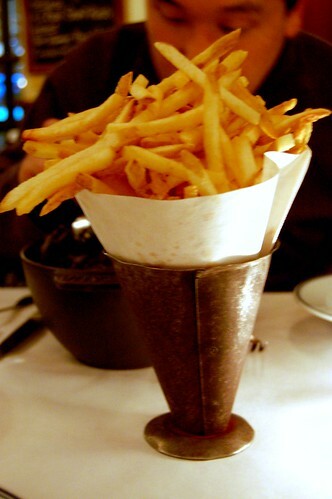 I love moules-frites. I love pork. 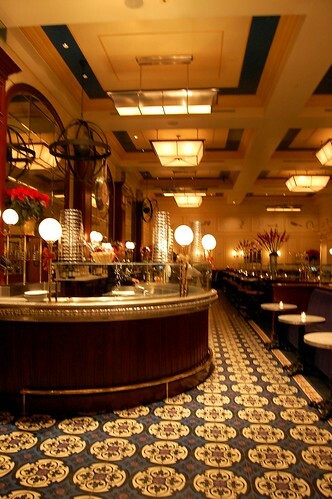 I think I need to go to bouchon. Cranberry sorbet sounds amazing! I love French onion soup too. Yum! That looks amazing. Especially the dessert. Mmmm. Again, everything sounds and looks great. You should really be charging these restaurants for the publicity you give them - your photos and descriptions are better than the any of ads out there! And I would just like to say ditto to Julie Q's comment...warm goat cheese may be one of the true loves of my life. Wowww...looks so good! And I'm surprised that the prices aren't even as much as I would guess them to be. Basically, I've been overpaying for food that doesn't look half as good as this. Harumph. I absolutely must have that French Onion soup. I think a trip to Vegas is in order for some delicious food. 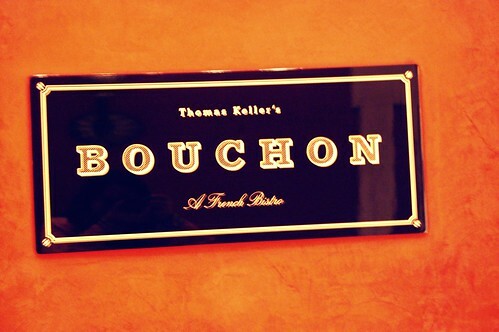 Only a few months until you'll have a Bouchon of your very own in LA! Hmmmmmmmm. I really wanna go to Vegas now. love mussels! it reminds me of paris cuz i had a bowl that felt like it was never ending. bouchon also has pretty good steak. i love french steak! though not the same as the ones in paris but still good. i heard they also have macaroons - didn't realize this when i visited last time. 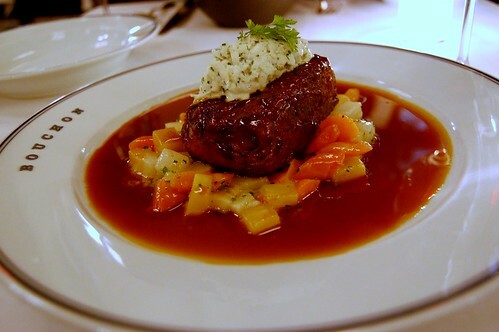 Your camera skills make this meal seem even better. Keep the review coming! 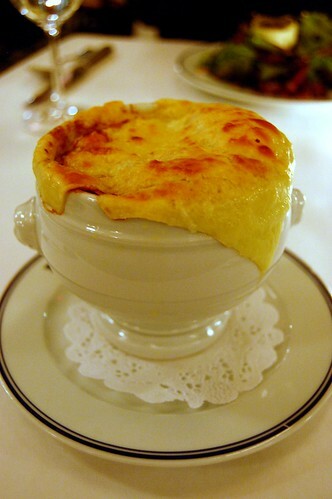 that french onion soup looks phenomenal, i seriously want some right this second. i like the onion soup, too. mmm. i'm thinking french laundry will be more impressive, when i get there. much more impressive. One of Mr. FGD's faves! I love a pleasureable french onion soup. Is it wrong that I'd need that onion soup to be the size of the bowl of mussels? YUM! oh man, french onion soup. and crusty bread. ohhhhhhh. Bouchon's a cool spot. When I arranged our sales & marketing meeting last year, we had our opening evening dinner at Bouchon... private room and everything. It was lovely. i had that salad as my starter, too. it was really yummy. i've already told jim that i plan on having bouchon bakery goods for breakfast each morning we're there in feb. he just laughed and said he figured as much. ah, he's so well trained. ha! Oooh! If it weren't for wedding planning, I'd SO be on my way to Vegas. Bouchon!